Some websites record the browsing activities of visitors. For example, a web site may track your activity to find your interests and display relevant content and advertisements. While this can make for a more personalized online experience, it can also allow websites to build a potentially invasive profile of your online activity. Content blocking prevents known trackers from recording your online behavior. A shield icon appears in the address bar whenever Ice Dragon blocks a tracker. 'Always'	- Ice Dragon will block trackers at all times in both normal and private browsing sessions. 'Only in private windows' - Ice Dragon will allow trackers in normal sessions but block them in private sessions. Content blocking is automatically enabled in private browsing sessions. Disabling it will apply only to the current session. It will be re-enabled when you begin your next session. Block all third party cookies or just those set by trackers. 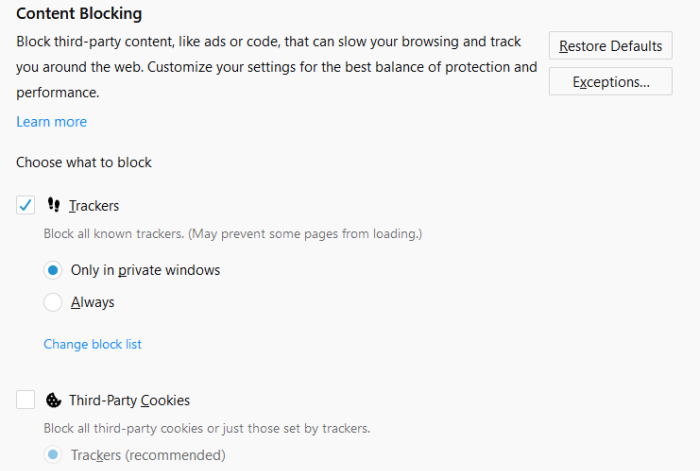 Trackers (recommended) – Blocks all cookies set by trackers. All third-party cookies(may cause websites to break) – Blocks all third party cookies irrespective website being open completely. 'Do Not Track' - An Ice Dragon setting that tells websites you visit that you do not want them to monitor or record your behavior. 'Always' - Will send the 'Do not track' command to every site you visit during both regular and private browsing sessions. 'Only when using Content Blocking is enabled'	- Will send the 'Do not track' command if tracking protection is active for your browsing session. Exceptions - A shield icon that appeared in your address bar indicates a blocking tracker on a site. All sites that allowed tracking list in the 'Exceptions - Content Blocking' dialog. Click 'Save Changes' to save settings.